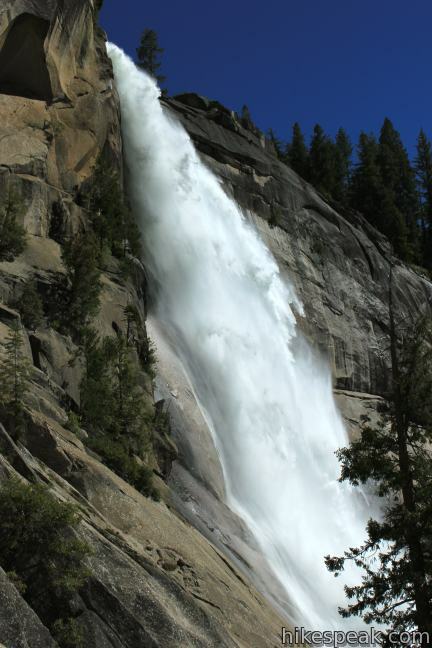 On the path to Half Dome, Yosemite’s most imposing bucket list hike, are two impressive waterfalls coursing down the Merced River. 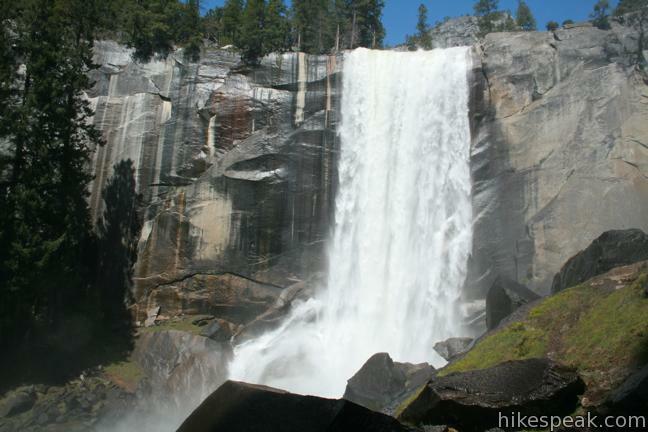 The Mist Trail provides the steepest most intimate experience of Vernal Fall and Nevada Fall. 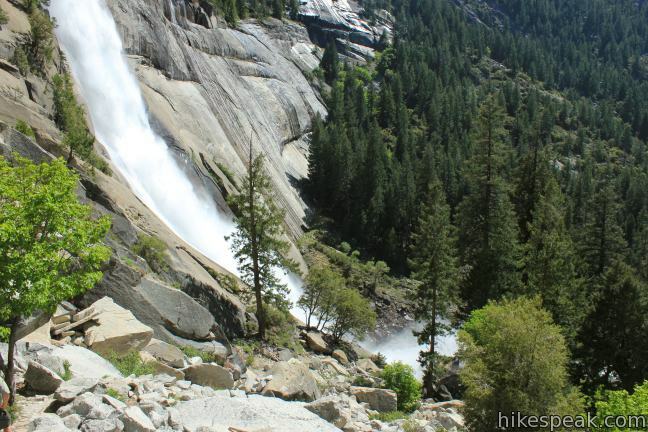 John Muir Trail takes a more gradual route to the top of Nevada Fall and is the most practical route for those continuing to Half Dome. 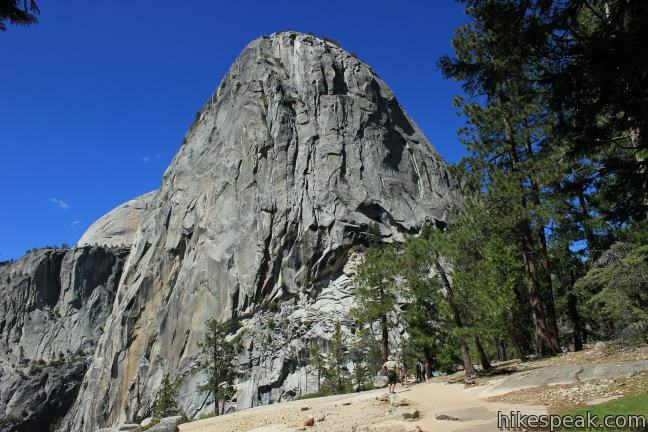 If those aren’t enough, get a permit, clear your schedule, and make the 16-mile 4,800-foot ascent on Half Dome. 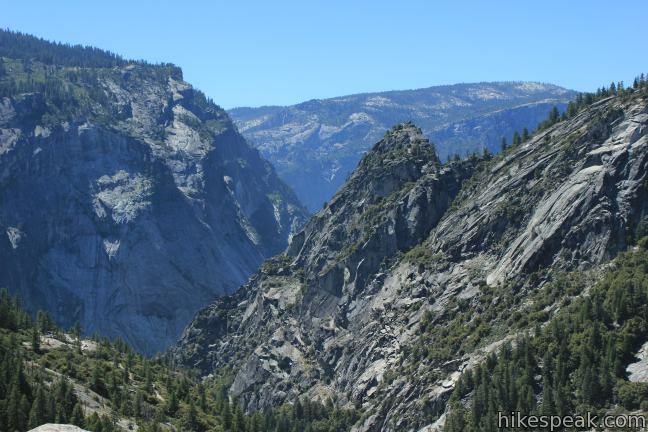 Another possible extension is the 10-mile one way hike up Panorama Trail to Glacier Point. 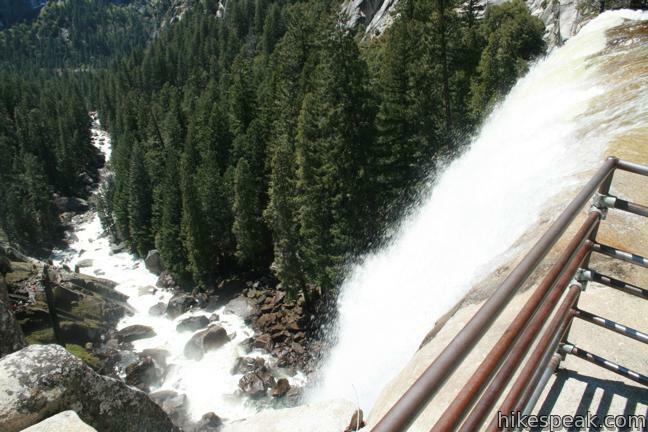 From Happy Isles Shuttle Stop near Curry Village, walk east across the bridge over the Merced River and turn right up the Mist Trail (passing the trail to the Happy Isles before crossing the bridge). 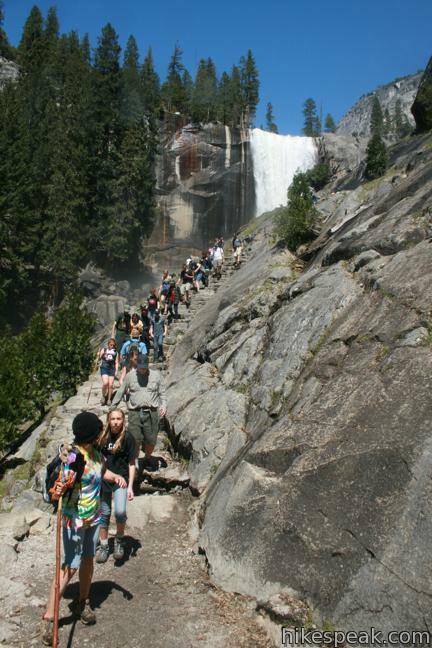 The Mist Trail is a wide trail that is paved for the first 0.9 miles to the Vernal Fall Footbridge. 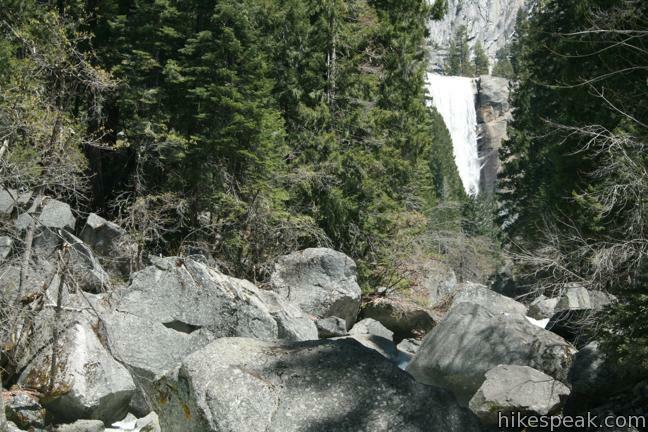 Hike through a mixed forest dominated by California bays up to a ledge around a bend in the river shaped like a backward C. When the trail turn left, look back down the valley for a distant perspective of Upper Yosemite Fall. Another gleaming waterfall is just ahead. Illilouette Falls tumbles down a side canyon to the south. 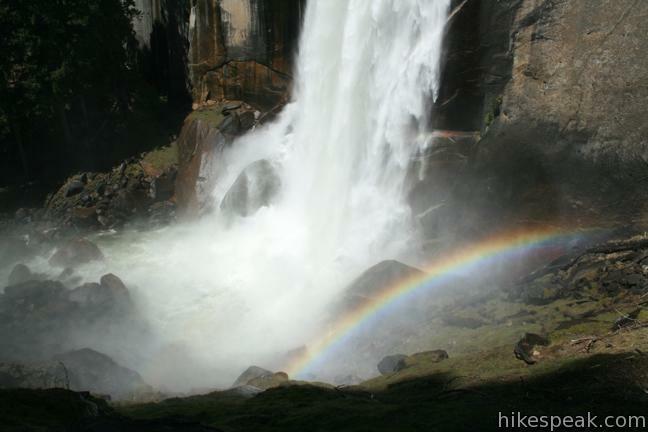 Since you can’t go more than half a mile on this trail without seeing a waterfall, you will quickly arrive at Vernal Fall Footbridge, with a view up the Merced River toward Vernal Fall. 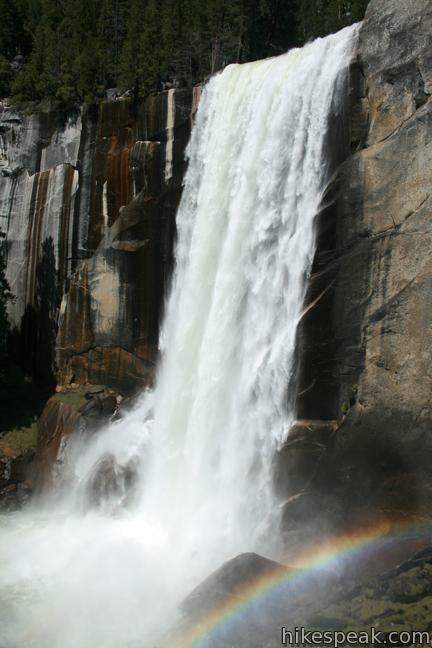 A million years ago, Vernal Fall and Nevada Fall were created by ice age glaciers. 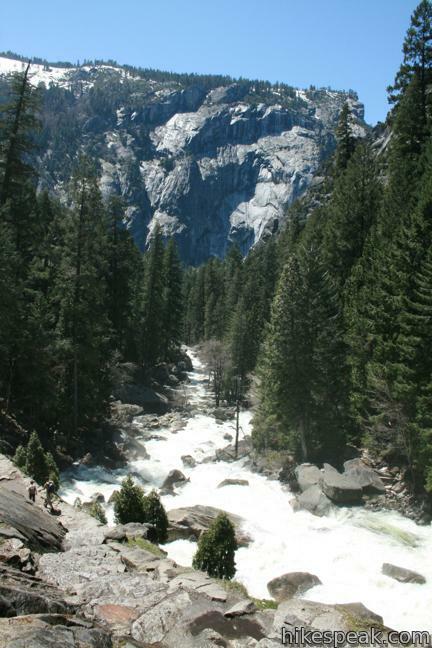 In areas where the bedrock showed weakness, glaciers spreading down the Merced River Valley dug away loose rock. 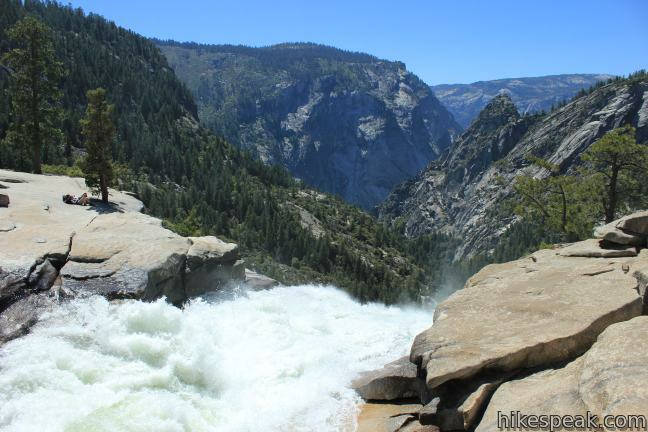 The hard granite that remained formed steep cliffs, including the 317-foot drop of Vernal Fall and the 594-foot drop of Vernal Fall just upriver. 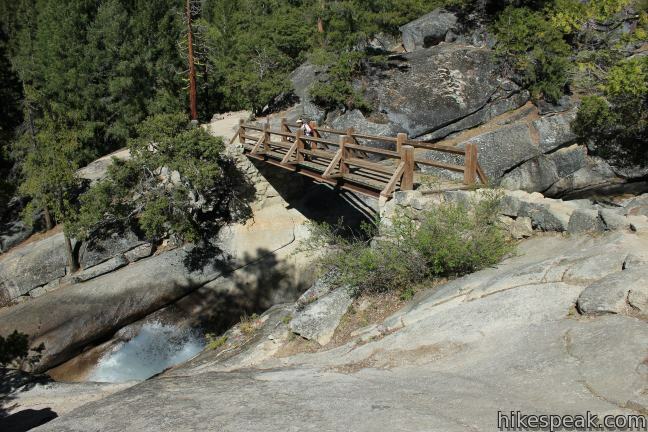 Cross Vernal Fall Footbridge and return to the forest to find drinking fountains and bathrooms. 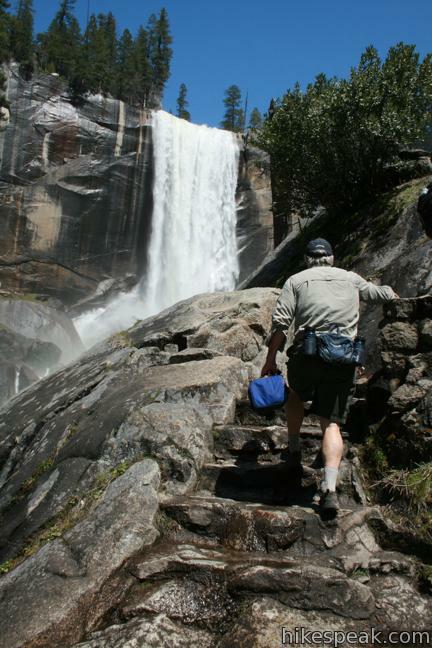 For an even better view of Vernal Fall, continue another quarter mile over gradual terrain to the bottom of the steps to the top of Vernal Falls. From here, the hike becomes strenuous. When the waterfall is at full blast in the spring, the Mist Trail is as cool and exciting a trek as you will find anywhere. It is amazing to be so close to such a powerful force of nature. Make your way up stone steps, pressing through gusts of refreshing spray to climb up the right side of the canyon. 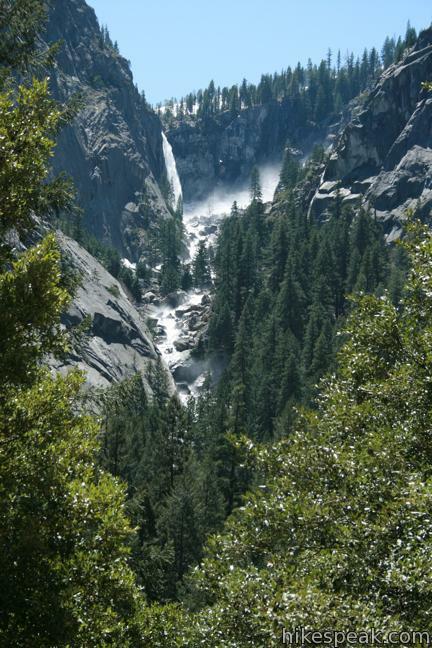 Reach a cluster of trees and climb a final staircase along a rock face even with the falls. 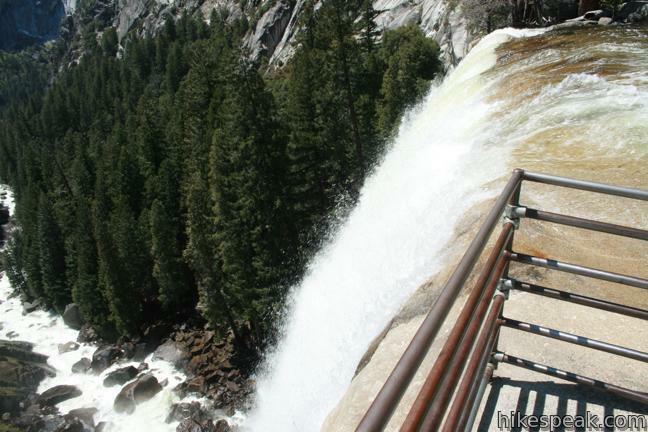 Leave the stairs and walk down a broad granite slab to a metal railing at an observation area next to the top of the falls. 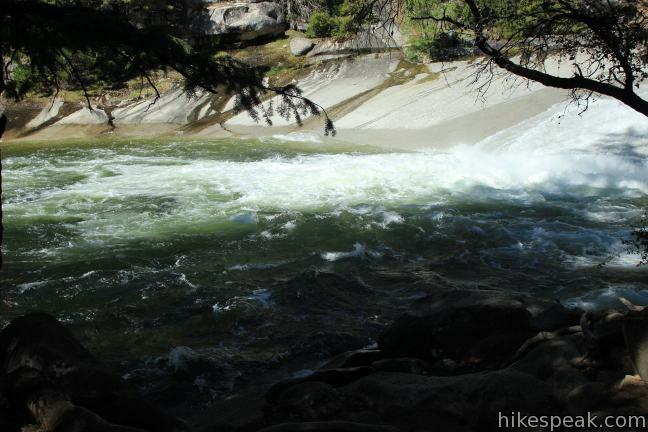 Take in an up-close perspective of the rushing water. 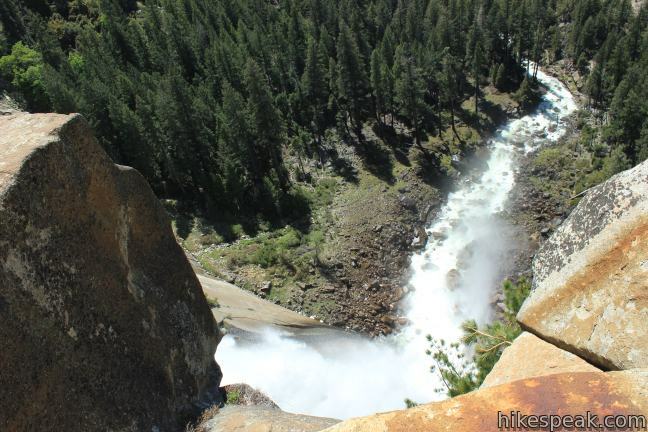 The hikers on the trail below look tiny from the top of this thundering waterfall. To continue to Nevada Fall, follow the trail along the right side of Emerald Pool, a wide stretch of the Merced River between the waterfalls. Pass another bathroom, and a junction with a connector trail heading up the John Muir Trail at Clark Point. 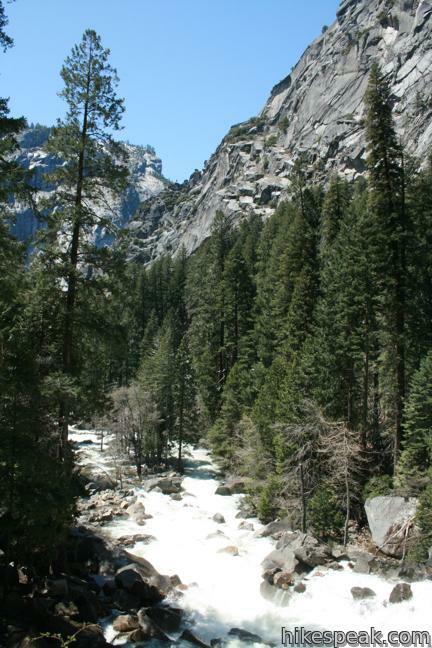 Take a bridge across the Merced River above Emerald Pool and a slickrock cascade called the Silver Apron. 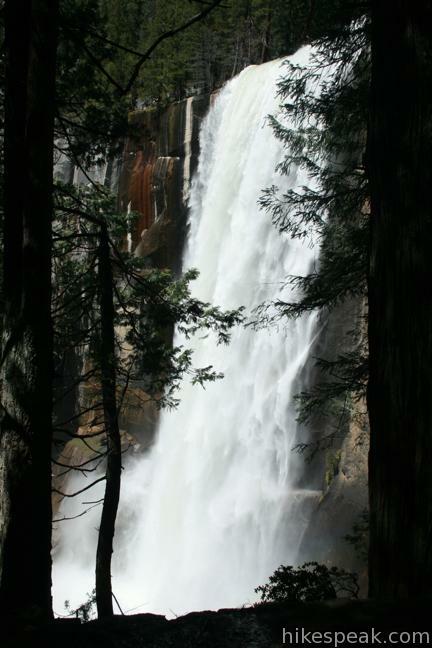 Leave the water and cross through a pine forest, eventually returning to the river near the base of Nevada Fall. 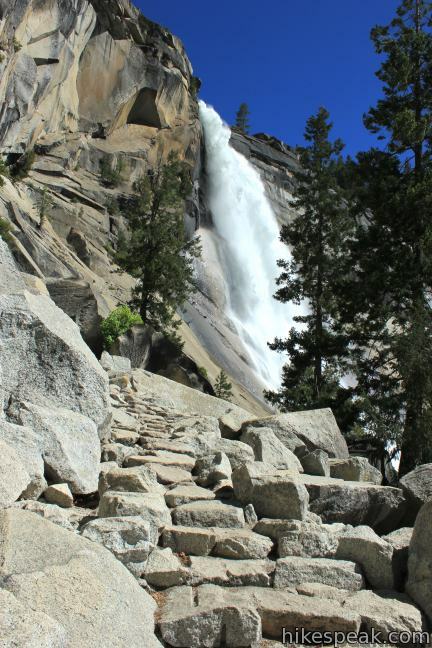 Embark up more stone steps to the left of Nevada Fall just below a massive granite dome named Liberty Cap. 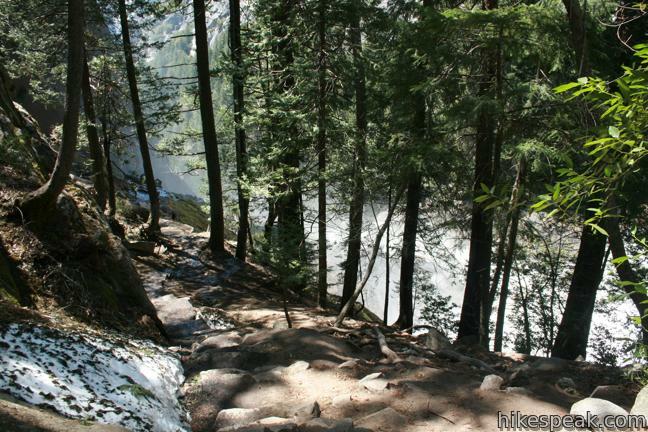 Mist Trail is a punishing but majestic climb. 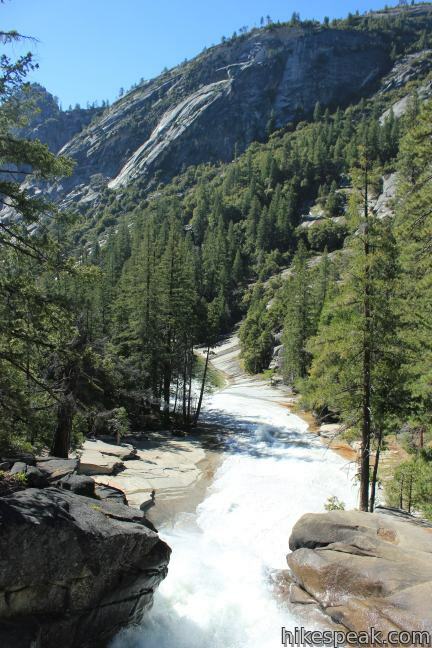 At the top of the Mist Trail (by another bathroom), turn right on John Muir Trail (Half Dome is to the left) and hike a quarter mile to the top of Nevada Fall. 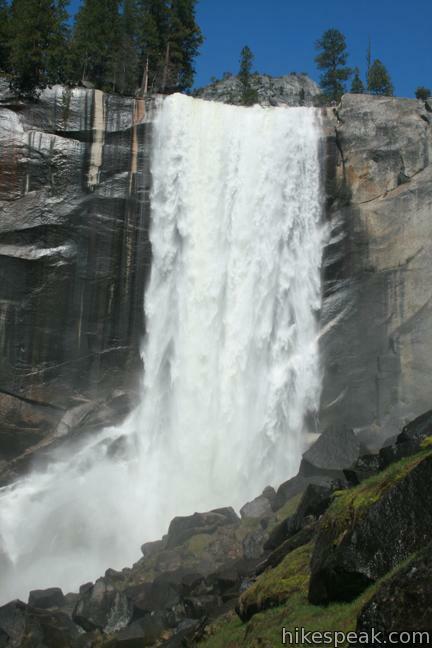 Sit beside the pool above the waterfall or venture down to an overlook alongside the brink of the waterfall. 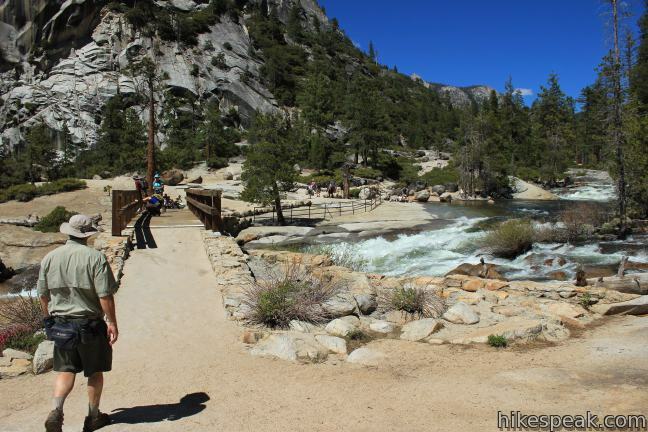 To loop back to the trailhead via John Muir Trail, leave the fine perch by cross a wooden bridge just above the 594-foot waterfall. 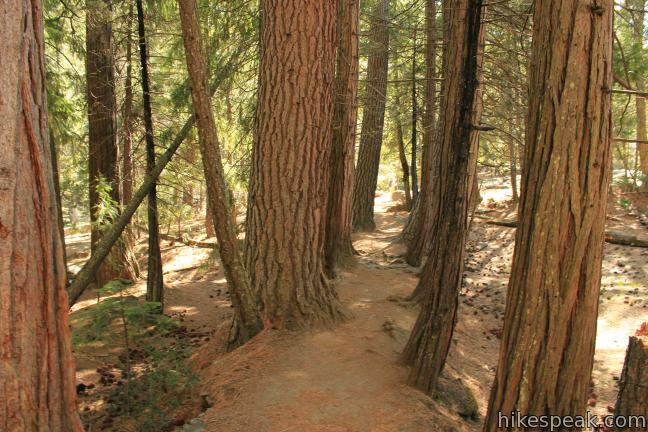 Take John Muir Trail south through a pine forest on the edge of the bowl hollowed out by Nevada Fall. 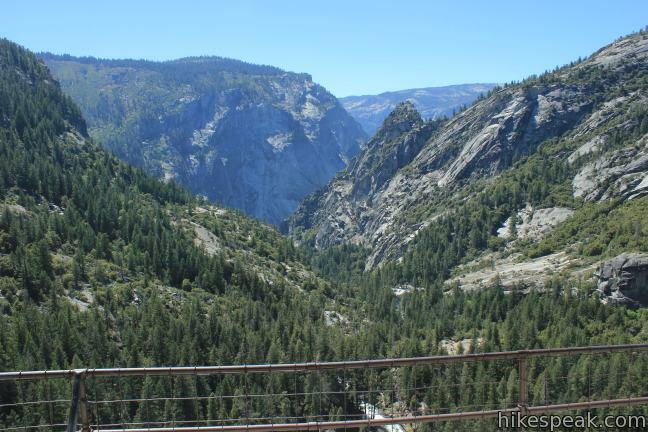 This stretch of the trail has excellent views of Nevada Fall and the Liberty Cap dome. 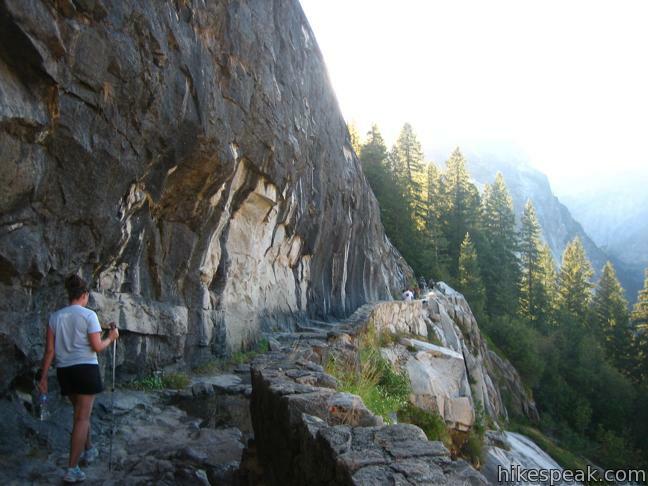 Follow an impressive stone walkway along the edge of the canyon to reach Clark Point. 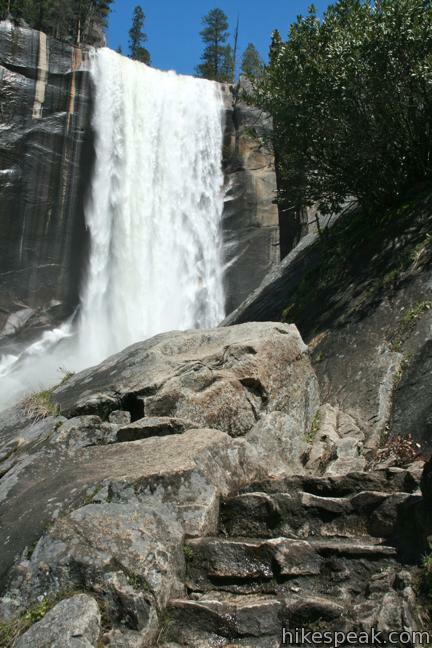 Turn right to descend to Emerald Pool if you wish to repeat the bottom of the Mist Trail alongside Vernal Fall. 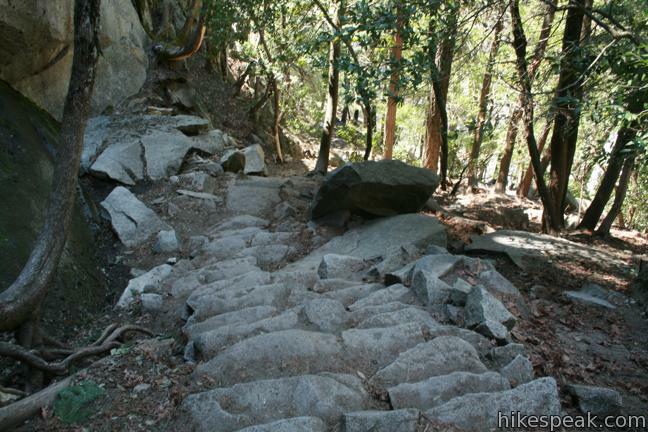 Otherwise, progress down a long series of switchbacks to the trail junction below Vernal Fall. 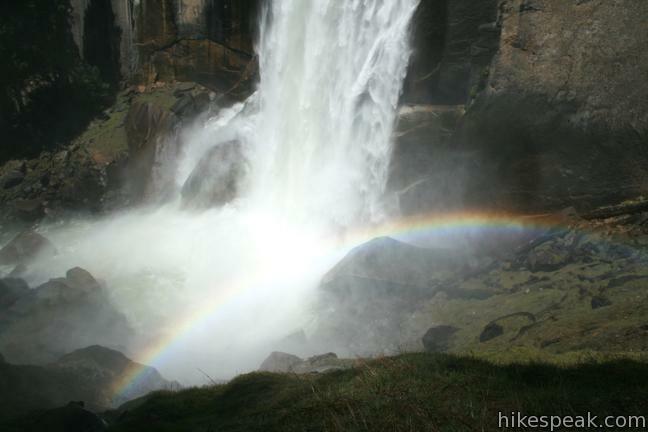 The Mist Trail – John Muir Trail Loop provides a memorable excursion in Yosemite National Park past two prize waterfalls. 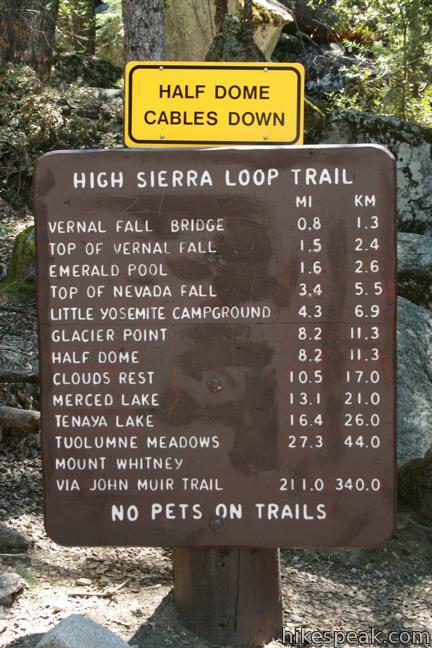 Check for trail closures that might affect your hike in the winter. 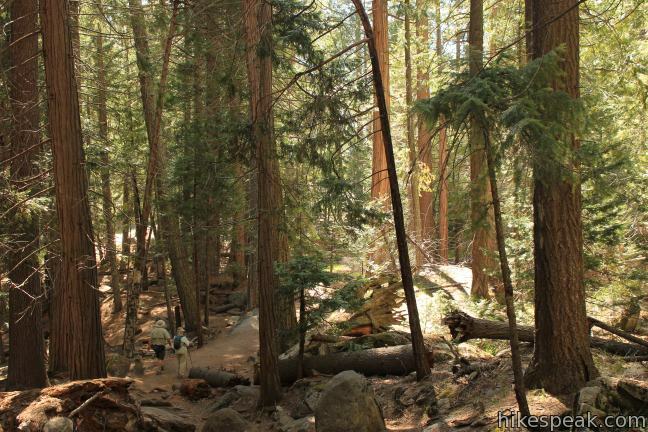 There are numerous places to enjoy a picnic lunch along the trail. 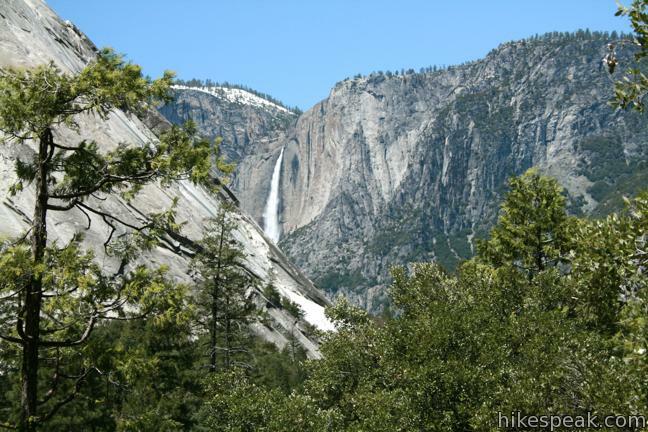 No permit is required to hike to the falls, but one is now required to hike to the top of Half Dome. 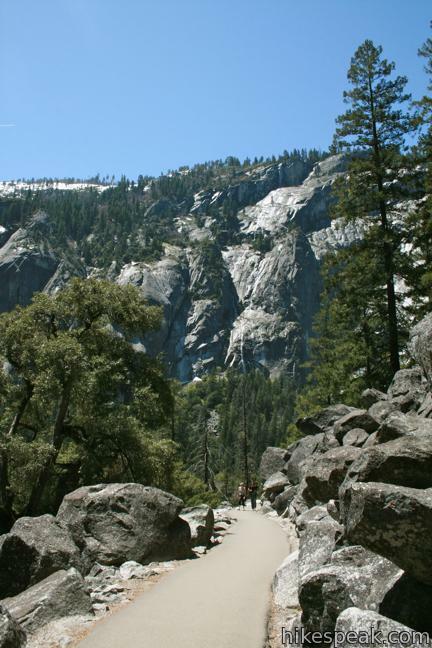 Another great hike is to take a bus up to Glacier Point and hike Panorama Trail down to the Mist Trail. 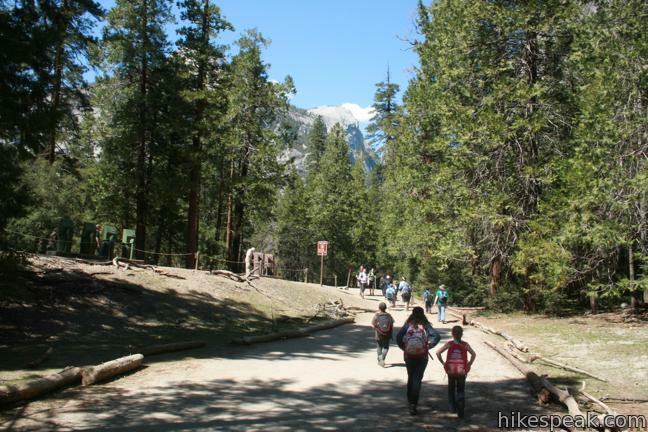 An entrance fee is charged to reach the trailhead in Yosemite National Park. 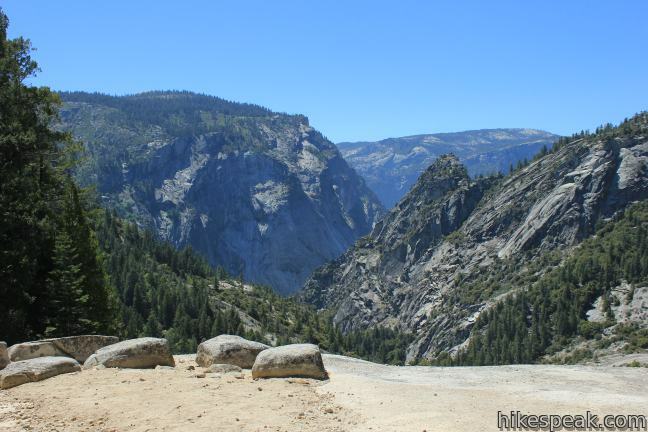 To get to the trailhead: Drive into Yosemite Valley and park at Curry Village or another available parking area near Yosemite Village. 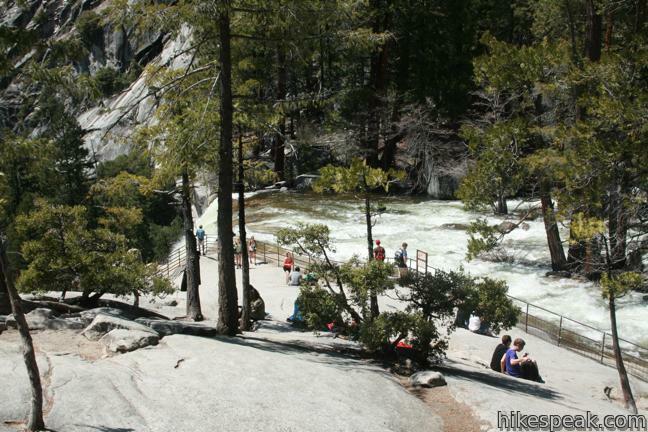 Take the free park shuttle to the Happy Isles Shuttle Stop and walk across the Merced River to the start of the Mist Trail. These photos were taken in September of 2007 and May of 2011 and 2012. Click to enlarge. Mist Trail to Vernal Fall by hikespeak.com. 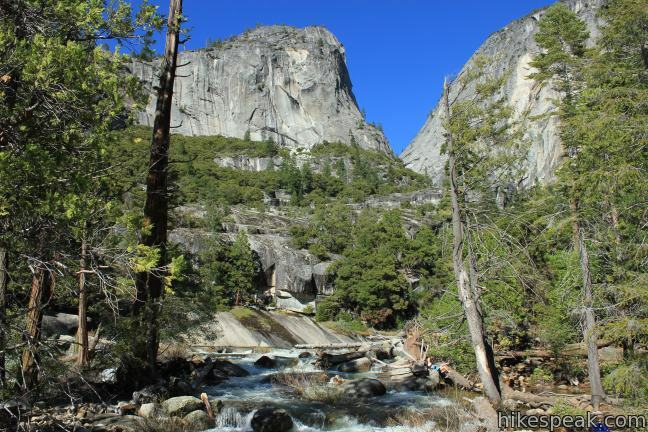 This epic 16-mile hike climbs 4,800 feet on one of Yosemite's most popular and most challenging trails. 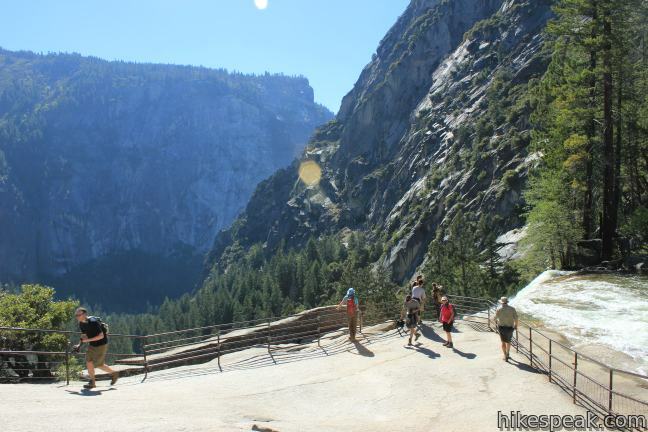 This nearly 10-mile long one-way hike travels from Glacier Point down to Yosemite Valley in the most scenic way possible, ending with the Mist Trail. 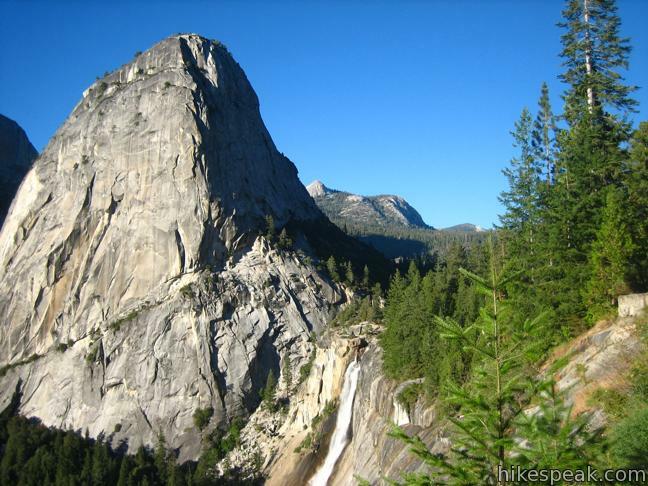 I hiked up to half dome when I was in college! This was my favorite part of the hike. 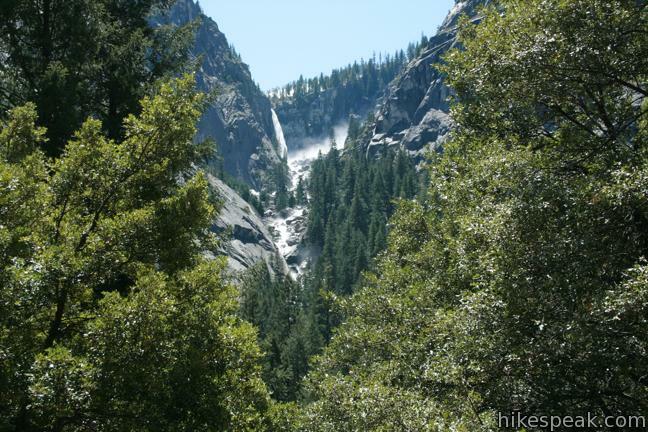 I’m planning hiking JMT = 05/28/2015 to 06/15/2015. I’m petite woman 5.2 height, 100 pounds. I’ve done a lot research, reading books, blogs, purchasing maps, watching videos, using google earth 3D, etc. 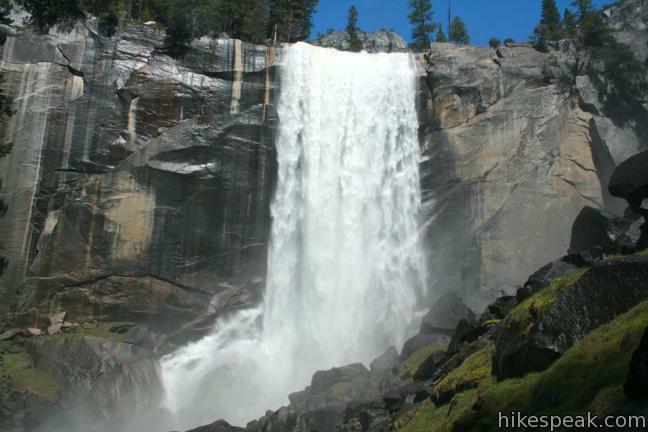 However, I haven’t get a clear answer about crossing creeks or streams at JMT. Are any serious (deep, dangerous)creek/stream from Happy Isles to Red’s Meadow Resort? The Shadow Creek and Shadow Bridge (from pictures) are a concern to me. 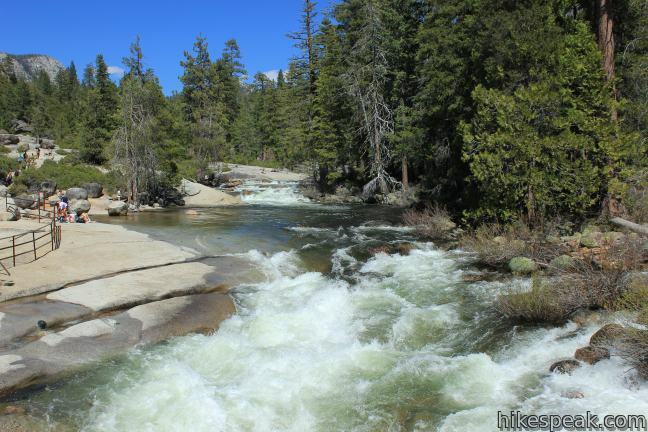 Could you please let me know if I’ll have trouble crossing Shadow Creek or ANY OTHER creek or stream along JMT trail from HAPPY ILSES to RED’S MEADOW during May 28/2015 to June 15/2015? Considering my height/weight and carrying a 40 pounds backpack too? Hi Nayara. 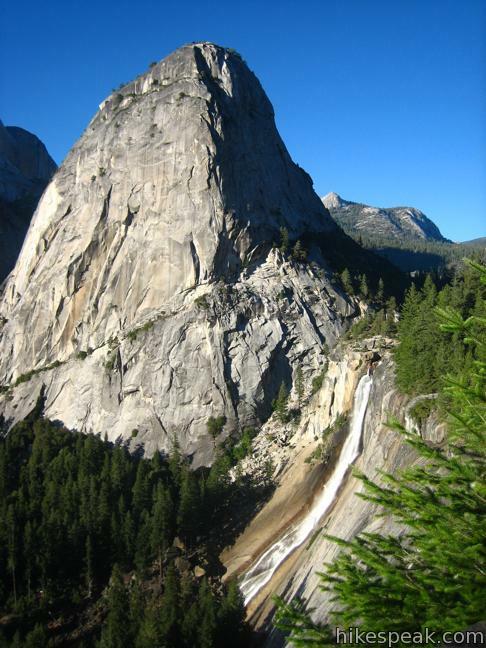 I am also in the 5’2″ club (a little shy of) and hiked down the JMT from Half Dome (went up via the Mist Trail). There is no crossing of the river other than over bridges. No one should go anywhere near the water as those who do risk being swept away. 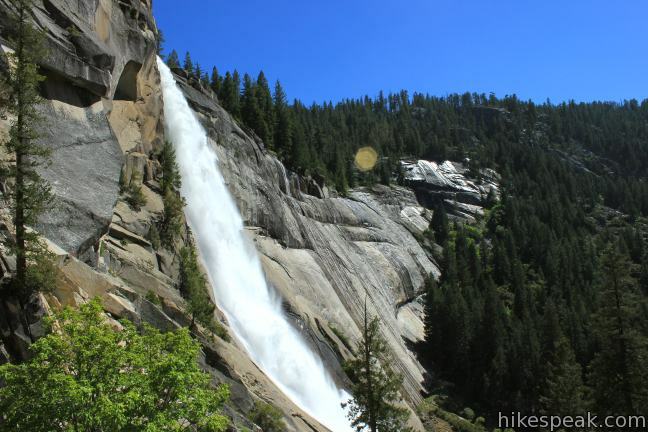 Has anyone taken a photo of that tree on top of Nevada Falls (near the falls) that is growing out of a crevice with a rectangular-shaped rather than round-shaped trunk? If so, I’d like to see your photograph. It was amazing. 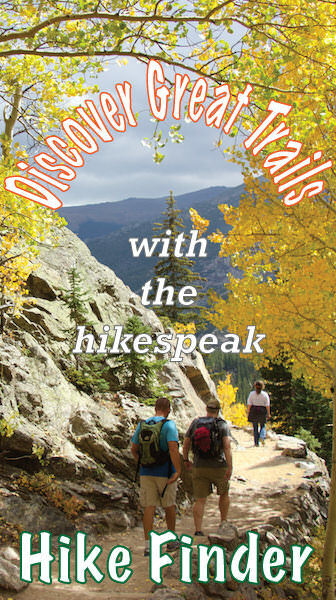 I see hiking as the most exciting part of adventure. And too in YNP. Anyway, great tips ahead. 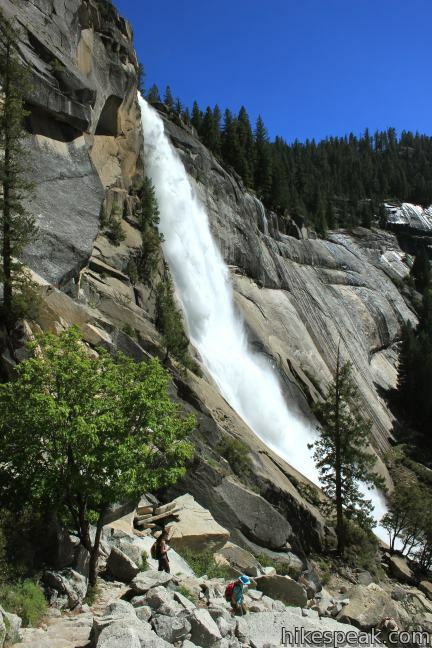 Has anyone taken a photo of that tree on top of Nevada Falls (near the falls) that is growing out of a crevice with a rectangular-shaped rather than round-shaped trunk?